It’s almost November and already Gingerbread House kits, Gingerbread ornaments, Gingerbread decorations, Gingerbread body scrubs are everywhere to be found. Dylans Candy Bar also has a Gingerbread House kit. 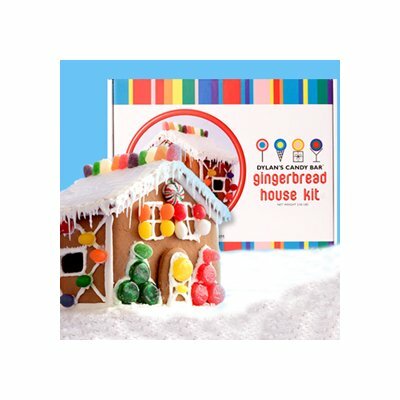 Pre-assembled Gingerbread House comes ready for you to decorate with the included green and white mints, mini gumdrops, jelly beans, Christmas candy corn, multicolor non pareils, mini candy canes, and mini lollipops. House is 11.25″W x 9″D x 12″T. From Dylan’s Candy Bar®. Dylan’s Candy Bar has elevated the candy shop to a world-class destination. Founded by Dylan Lauren, daughter of legendary designer Ralph Lauren, this “candycopia” offers over 5,000 types of candy in unique pairings that speak with a playful wit. Jellybean birthdays, white-chocolate weddings, honey-drizzled holidays—any occasion becomes much sweeter when topped with the technicolor treats of Dylan’s Candy Bar.